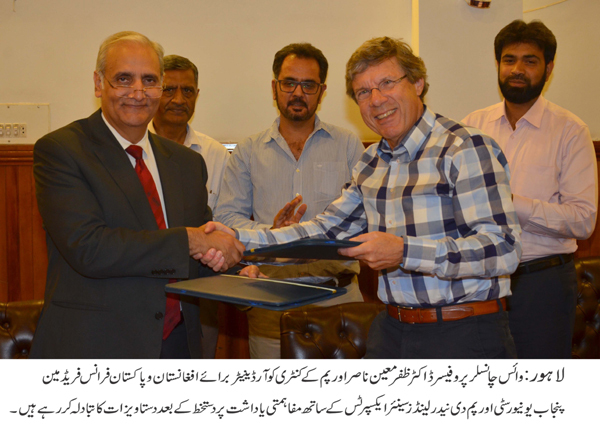 LAHORE: (Wednesday, May 17, 2017): Punjab University has signed MoU with a Belgium-based PUM-The Netherlands Senior Experts for improving quality of research, projects and other areas of mutual interest. 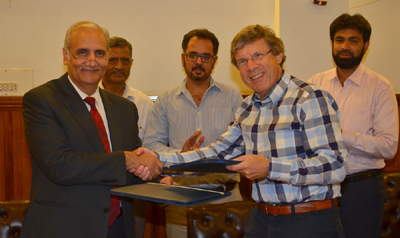 In this regard, an MoU signing ceremony was held at committee room of the Vice Chancellor’s office. PU Vice Chancellor Prof Dr Zaffar Mueen Nasir, Office of Research, Innovation and Commercialization Director Prof Dr Tahir Jamil, PUM-Netherlands Country Coordinator Afghanistan, Pakistan Mr Frans Friedman and others were present on the occasion. According to MoU, PUM-The Netherlands Senior Experts will provide PU with consultancy services through deploying senior experts as volunteer professionals on mutually agreed conditions and understanding. Addressing the meeting, Dr Zaffar Mueen Nasir said that the purpose of the MoU was to define the contents and priorities of the consultancy services PUM in collaboration with PU would execute a fact finding a fact finding mission. He said that after successful execution of the fact finding mission, PU and PUM would draft a mutually to be agreed project plan which would specify the consultancy services and the timeline. He said that PUM senior experts would also make special travel arrangements for the senior expert.